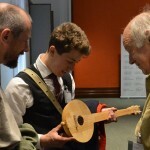 A saddler, a wheelwright, and a sawmaker were among the people recognised for their contribution to heritage crafts at the Heritage Crafts Association annual conference at RIBA in London on 7 May. Almost 200 people attended the conference, Craft Across Continents, which focused on how craft and heritage is supported and promoted across the world. The day included talks from a range of speakers, and an opportunity for makers to pitch their products to Genevieve Sioka, artisan buyer for the National Trust. 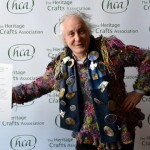 The conference was part of the second London Craft Week, a celebration of makers and craftspeople across London. Saddler and side saddle specialist Coralie Chung was awarded an HCA/QEST Training Bursary. Coralie plans to use the bursary to study with Roger Godden, one of the remaining master side saddlers, at the Saddlery Training Centre. 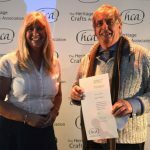 Basket makers John Cowan, Julie Livesey, and Emma Purcell each received an HCA/NADFAS Heritage Crafts Bursary. All three are established basket makers and plan to use the bursaries to acquire further skills with master basket makers in England, France and Ireland. Priscilla McGirr was awarded the Marsh Volunteer of the Year. As chair of Alford Craft Market, Pris has led and organised a variety of events to promote Lincolnshire crafts. This has included demonstrations of mud and stud building, pole lathe turning, pottery, spinning, and Lincolnshire ladder back chair making; and workshops in ceramics, rag rug making, willow weaving, and knitting. Shane and Jacqueline Skelton, of Skelton Saws, received the Marsh Made in Britain award. Inspired by the master saw makers of the 18th century, Shane sources his materials – wood, brass, steel – from the UK, often from the area surrounding his workshop. He works with a furniture-making faculty at a college in Warwickshire and, later this year, will be holding one-day courses on saw sharpening to share his skills. Weaver Jason Collingwood was awarded the Marsh Trainer of the Year. Jason was taught to weave by his father and, in 1986, set up his own workshop. Since then Jason has woven more than 2,000 rugs and worked with architects and interior designers in the UK and overseas. He has taught traditional rug weaving skills to more than 10,000 people through group workshops, seminars, and residential one-to-one courses for beginners and skilled weavers. 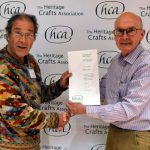 Master harp maker Allan Shiers, of Telynau Teifi, was awarded the HCA Maker of the Year. Since completing a five-year apprenticeship in 1978, Allan has spent almost 40 years sharing his knowledge and craft. In 2005 he established a not-for-profit community business, which has made more than 900 harps, to ensure a future for harp-making in Wales and he has continued to encourage younger harp makers through apprenticeships, workshops, and masterclasses. 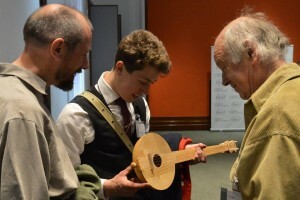 Enameller Jane Short MBE, guitar maker Roger Bucknall MBE, and woodturner Ray Key BEM were presented with certificates to mark their inclusion in the Queen’s Birthday Honours List last year and the New Year’s Honours List earlier this year. 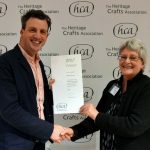 The Heritage Crafts Awards celebrate and highlight the traditional living crafts made in the UK that contribute to our national heritage. The photograph shows David Bell Memorial Fund Award winner Joe Fredericks chatting to conference delegates.